Houthi Fighters Carry Out Several Attacks In Southern Saudi Arabia (Video) 4.5 out of 5 based on 8 ratings. 8 user reviews. On September 22, Houthi fighters carried out a series of hit and run attacks on border posts of the Saudi military in the Kingdom’s southern provinces of Jizan and Najran, according to the Yemeni al-Masirah TV. 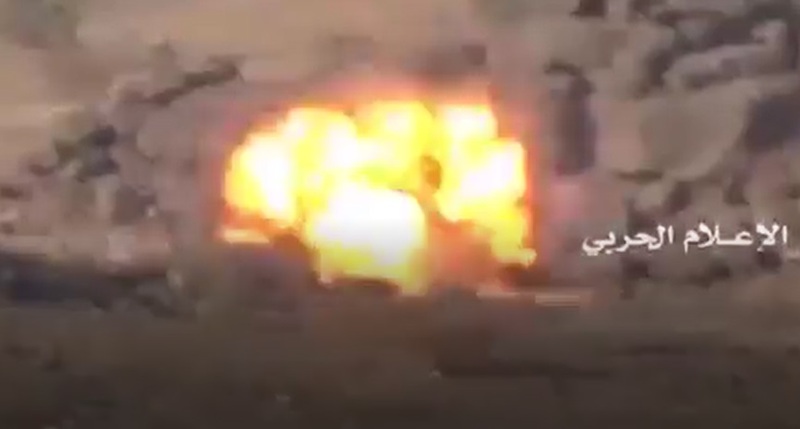 During the attacks, the Houthis destroyed an M113 armored personnel carrier (APC), a pickup truck and a bulldozer of the Saudi military with anti-tank guided missiles (ATGMs) and an anti-tank mine. Several Saudi-backed Yemeni fighters were also killed and injured. In the last two weeks, the Houthis focused on repelling a surprise attack of the Saudi-led coalition one their positions in the district center of al-Durayhimi and the area of “Kilo 16” on the western Yemeni coast. Now after the failure of the attack, the Yemeni group is once again stepping up its cross border attacks. The Saudi-led coalition usually responds to such attacks by carrying out limited ground operations in northern Yemen. However, this strategy has failed to push the Houthis away from the Yemeni-Saudi border or even to prevent their constant attacks on targets in Saudi Arabia. About your last statement, South Front; the inverse is also true. There is a difference though. The difference being Saudi Arabia has all the money in the world and the western and arab worlds and their moms helping it. So the fact that they can’t deter the Houthis is different from the Houthis not being able to deter them. Context my friend, but I can’t expect much from a bloke who thought the Saudis would surely take Hudeideh a few months ago. The difference is the Saudis can do this forever, and could end this right now if it weren’t for chronic lethargy. You really don’t know the first thing about this, do you? 1- They cannot end it right now – the pretender to the crown MBS owns this debacle and has no exit strategy without appearing rash and inexperienced. 2 – KSA is running a state budget deficit, burning through cash reserves, and just gave up on expected cash injection from listing Aramco on stock market – they cannot finance this ‘forever’. I am not the retard that thinks the Saudis can end this whenever they want. Nor am I the idiot that thinks the Saudi’s can do this forever. Nor am I the mongrel that thought with all the confidence in the world that the assault on Hudaydeh a few months ago was for sure going to succeed. No – Bin Salman Jr launched this war without much forethought and is now trapped in it. KSA simply cannot win their objectives outright – but Bin Salman Jr fears any public admission of failed military adventurism – and loss of credibility as a rash and impetuous leader. It is called arrogance – and leads to no exit strategy. If it were true. The Saudis face severe financial problems – and this war of attrition hurts them, badly. I wouldn’t be surprised to learn that Houthis are secretly supplied directly through Saudi’s land with all the incompetence, corruption and the dissidents inside SA.